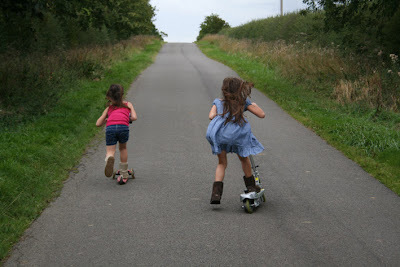 I am in need of some roller boots to keep up with my two scootering antics! Fab! That looks fun, they could go for miles. Mine drive me mad going around the kitchen on a scooter! You've captured all the movement and speed and still kept it in focus! I love it. Fabulous! Looks slightly exhausting though? Did you have to run after them? *she asks as she lazily sits on her sofa, computer on lap* !! What a lovely photo. Don't know why but it made me think of a scene from an old kids movie 'Stand by me'. Tiz good, BUt the one we were going to do in the hotel is better. Fact!